Condition: Excellent. Luxury framed in a large gilt list with black passe-partout of 69 x 90 cm. Rare etching and engraving. Very large and impressive view on the "Colosseo" and the "Arco di Constantino", extremely detailed and nicely engraved. Title in Latin on a banderole hold by putti. The conical fountain "Meta Sudans" on the foreground, surrounded by peasants. 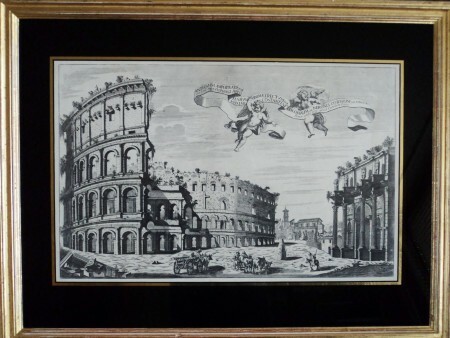 Engraving and etching after Giuseppe Tiburzio Vergelli, published by Carlo Losi in Rome, 1773.